KANSAS CITY, Mo., May 1, 2018 — (PRNewswire) — Joining enthusiastically with Star Wars fans worldwide, Hallmark announces plans to celebrate 2018's Star Wars Day on May the 4th, with new products in Hallmark Gold Crown® stores and online as well as with a social media sweepstakes. "As big fans of the Star Wars series, we love creating products with the iconic characters of the saga," says Christine Taylor of Hallmark Licensing. 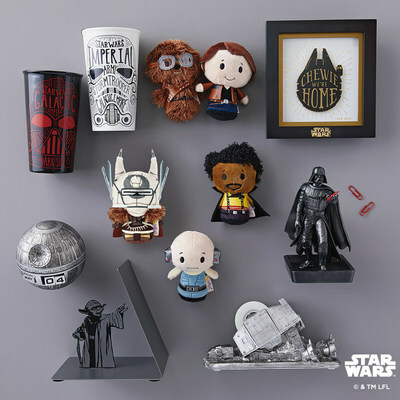 "Hallmark brings the wit and fun of the characters to life with products that provide the perfect way to connect multiple generations of Star Wars fans." The newest items to join the Hallmark galaxy of Star Wars products—including those from Solo: A Star Wars Story, which will arrive in theaters May 25—land in Hallmark Gold Crown stores soon. Great new Star Wars gifts expand a robust collection of products that offer clever plays on the characters and famous movie lines. Among new products is an itty bittys® plush character of Lobot, Lando Calrissian's trusted associate. The limited-edition character features his signature cyborg headgear as seen in Star Wars: The Empire Strikes Back. Additional new products include ceramic travel mugs, framed quote signs, and desktop office organizers such as an AT-AT™ themed tape dispenser and Darth Vader™ themed magnetic paper clip holder. Other items including Hallmark Keepsake Ornaments will be available for preordering. PopMinded by Hallmark will also debut two exclusive ornaments including a BB-8™ themed Mystery Box Keepsake Ornament and BB-9E™ themed Keepsake Ornament. Select Hallmark Gold Crown stores will be offering in-store promotions for the celebration of May the 4th, including a free limited-edition three-piece pin set and discounts on Star Wars merchandise purchases. Check with local retailers for details. This week, posting a photo of your Star Wars collection to Instagram could result in winning a Star Wars prize pack from Hallmark. A post using #HallmarkSweepstakes and the tags @Hallmark and @HallmarkStores could be eligible for the chance to win prizes including itty bittys™ plush characters, Storyteller Keepsake Ornaments, and Hallmark products created exclusively for attendees of Star Wars Celebration. Visit http://bit.ly/HMKinstasweeps for details. Those visiting Hallmark eCards can send their friends and family a host of Star Wars themed ecards, including a Han Solo vs. Greedo e-card. Also they will offer 20% of ecard memberships to Star Wars fans with the code Maythe4th. The 2018 Hallmark Keepsake Ornament line, which features Star Wars characters and starships, was just unveiled in the Dream Book and will be available starting in July in Hallmark Gold Crown stores and online. The complete selection of Star Wars items can be found in Hallmark Gold Crown stores and online at Hallmark.com; use the store locator to find a nearby store. STAR WARS and related properties are trademarks and/or copyrights, in the United States and other countries, of Lucasfilm Ltd. and/or its affiliates. TM & © 2018 Lucasfilm Ltd. All rights reserved. All other trademarks and trade names are properties of their respective owners. Company Name: Hallmark Cards, Inc.